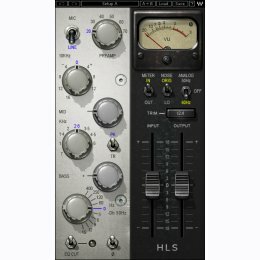 Developed in association with legendary producer/engineer Eddie Kramer, the HLS Channel was meticulously modeled on a Helios mixing console just like the one he used in historic sessions at London’s acclaimed Olympic Studios. (In fact, we actually managed to get our hands on the Helios from the Rolling Stones mobile truck, which was used on a slew of classic recordings during the early ‘70s.) In addition to modeling the Helios EQs with their sweet saturation, high-end presence, and fat low-frequency boost, we even modeled the unique behavior, coloration, and drive of the console’s preamps. To top it all off, the HLS Channel features a precision-modeled VU meter that recreates the sensitivity, ballistic behavior, look and feel of the original.